Vinton Cerf, 2007. By Joi Ito (Flickr) [CC BY 2.0], via Wikimedia Commons. 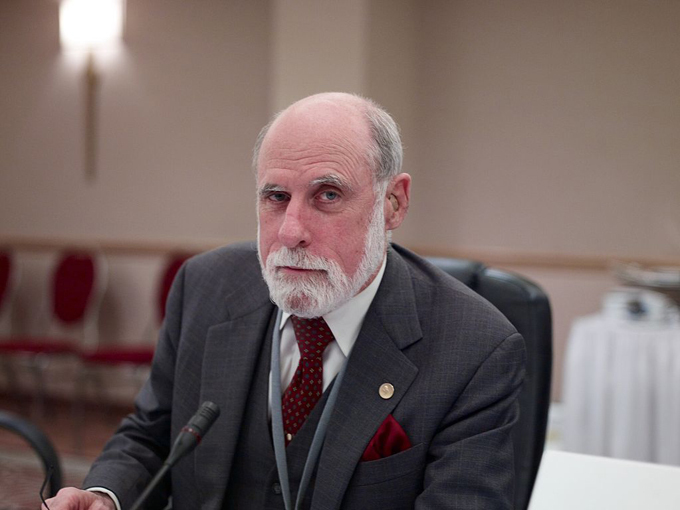 “We are nonchalantly throwing all of our data,” said Dr. Vinton Cerf, the vice president of Google, in a recent address to American Association for the Advancement of Science, “into what could become an information black hole without realizing it…. In our zeal to get excited about digitizing we digitize photographs thinking it's going to make them last longer, and we might turn out to be wrong.” And if we do turn out to be wrong, Cerf continues, then we will probably leave few historical records behind us. Our excessively documented age will simply disappear. Cerf’s comments might come as surprise to some. When expressing fears over our digital records, we focus much of our concern focuses on permanence—the idea that, for instance, an unkind or embarrassing action could linger on and haunt us long beyond any reasonable amount of time. When looking at the recent hiring-and-firing of Ethan Czahor, Jeb Bush’s tech officer, many draw the obvious moral that it is unwise to tweet. "Everyone of Czahor's generation and younger," says Caitlin Dewey of The Washington Post, "will come with some kind of digital dirt, some ancient tweet to be deleted or beer-pong portrait to untag." This is, of course, true. But it’s also true that those tweets don’t stay accessible as long as we might think. Without requesting my archives or searching for specific terms, I can’t access my own tweets past a certain point (last I checked, mid-December). For those who use Twitter, as I sometimes do, as a way of taking notes, this discovery can be very unwelcome. The archive still exists, of course. I can get to it if I want. But as Cerf points out, it may be that in three or four years that archive, downloaded to my computer, may exist in a form I’m unable to open; and Twitter may no longer exist to provide them to me in a format that I can use. These tweets are no great loss to anyone, of course, not even to me, and in their contents they do not even rise to the level of the mildly scandalous. All the same, it came as a shock to realize how many small notes of mine were functionally inaccessible to me. In fact, thinking into the future with our current technology is a difficult task in many respects. You can, if you so desire, write an email to the future, which is by itself a fairly draining spiritual exercise. But are you really so confident that you know the email address you'll use in the future, let alone that you'll be using email at all? Even the links in this blog post—to well-established outlets like NPR, the Washington Post, and The New Yorker—will be good, in all likelihood, only until one of those websites undergoes a redesign, at which point they will either be broken, or full of typographical errors introduced by the change. (On the shelf life of this blog post itself, I'd prefer not to speculate.) As Jill Lepore documents, also in The New Yorker, there are those who dedicate their working lives to ensuring that many webpages are captured and preserved. But even then, such preservation will only last so long as the ability to read it does. As Cerf points out, that may not be as long as we think. There are a few lessons to be drawn from our possible obsolescence, one being simply that technology rarely delivers on its claims, whether they are for good or for evil. The perfect archive, where all our works are lifted outside time, simply does not exist and will not exist. A digitized photograph may disappear or become unreadable, but so will a real one, particularly if care is not taken to preserve it. It's a small comfort to the Ethan Czahors of today that, eventually, their youthful stupidities will be rendered incomprehensible—but it's probably true, although not so quickly as they'd like. But for those of us archiving things of our own that are merely important to us, Cerf's comments come as a reminder that preservation can't simply be left to chance or to a technological infrastructure that we trust too much. A late adopter of smartphones, I still keep my old phone because it has a handful of texts of sentimental value. To transfer them off my "stupid" phone should be pathetically easy. But the phone is too old; no one I've gone to can get the texts off of it. "If the FBI wanted the texts off this phone," I said with irritation to a friend, "I'm sure that they could get them—so why can't I?" Well, maybe they could. Perhaps they would be just as helpless as I am. One day, the phone will break down, those communications gone for good, unless I do the work of typing them up from the phone by hand before this happens. What we really desire to bring with us into the future, we will have to bring on purpose; the things we wish to remember, we are going to have to choose.